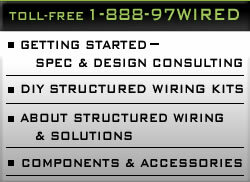 Information about structured wiring kits, how they work, and design services available. How to order design service and guidelines for information necessary to complete services. General information about the process and advantages of structured wiring in addition to various possible solutions. A general list of various products avaiable for add-on components and accessories after the structured wiring kit is installed. List of links to helpful DIY web sites and other home wiring-related services..
How to reach DIYStructuredWiring.com whether by phone, e-mail, fax, or mailing address.